As I got back from fall-break, the print versions of our two latest publications, one article and one book chapter, were on my desk. Call me old-school, but I enjoy holding the book in my hands, and book chapters are really best read in context with the rest of the volume. Eivind Heldaas Seland (2014) Caravans, Smugglers and Trading Fairs: Organizing Textile Trade on the Syrian Frontier. Pages 83-90 in Kerstin Droß-Krüpe (ed. 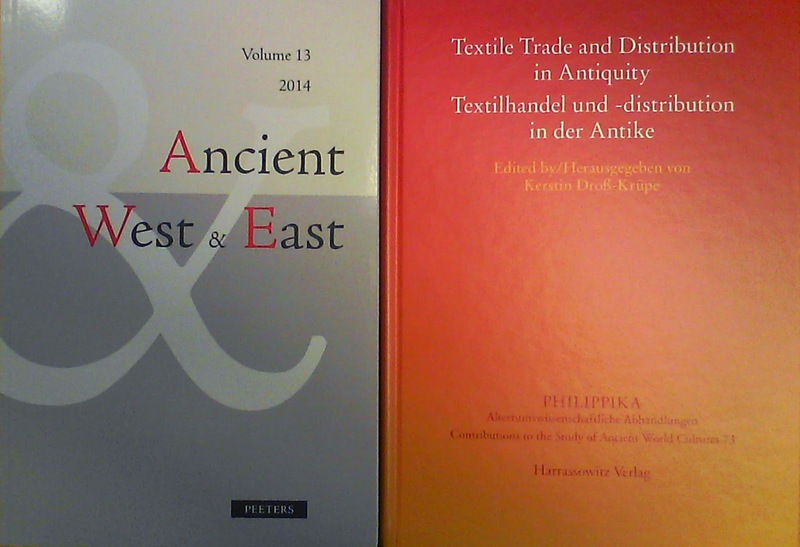 ), Textile Trade and Distribution in Antiquity. Harrassowitz Verlag. Eivind Heldaas Seland (2014) The organisation of the Palmyrene caravan trade. Ancient West and East 13, pp. 197-211. doi:10.2143/AWE.13.0.3038738. As a word of warning to Network Analysis enthusiasts, there is nothing of that in these articles, both, however, address how networks operated, and how we can approach this by means of modern models, in this case New Institutional Economics. The AWE article is available online, the book chapter unfortunately not. Also, it was not possible to publish these open access. Preprints should appear in Bergen Open Research Archive (BORA) in time (they are not there yet). Meanwhile, drop me a line if your library does not have these and you require an offprint.